Tanna of the second century; contemporary of Akiba. 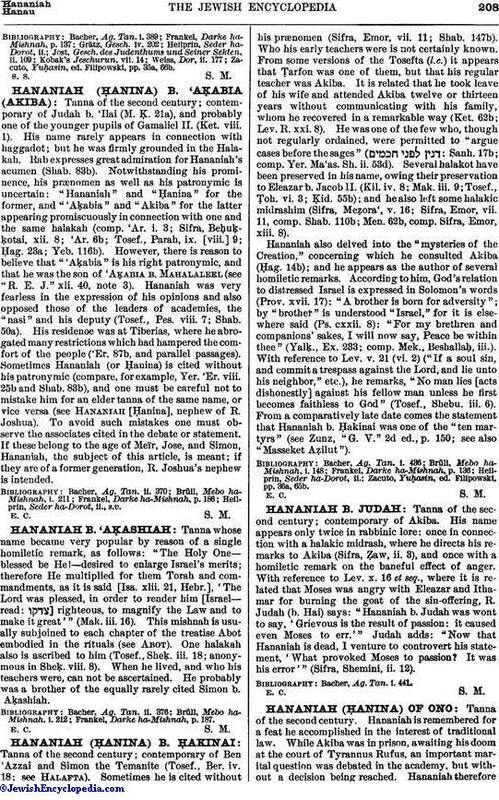 His name appears only twice in rabbinic lore: once in connection with a halakic midrash, where he directs his remarks to Akiba (Sifra, Ẓaw, ii. 3), and once with a homiletic remark on the baneful effect of anger. With reference to Lev. x. 16 et seq., where it is related that Moses was angry with Eleazar and Ithamar for burning the goat of the sin-offering, R. Judah (b. Hai) says: "Hananiah b. Judah was wont to say, 'Grievous is the result of passion: it caused even Moses to err.'" Judah adds: "Now that Hananiah is dead, I venture to controvert his statement, 'What provoked Moses to passion? It was his error'" (Sifra, Shemini, ii. 12). Bacher, Ag. Tan. i. 441.